Shop Now Starting at $16 per set. Assembling your cable railing system will require a number of our Marine Grade 316 Stainless Steel cable end fittings. One goes at each end of the cable to attach it to the terminal posts. They are specifically designed to fortify our CableView railings (as well as many other railing systems), guaranteeing long-lasting corrosion resistance and beauty. The type of end fittings you choose will depend on your post material and personal eye for design. Knowing how many terminal posts you’re using, will help you to determine how many of each type of fitting will be needed. Each individual terminal post will require one fitting per cable. Our pre-drilled posts for a 36” rail height have holes for 11 cables, meaning you would need 22 fittings for a railing project with two terminal posts. Our pre-drilled posts for a 42” rail height have 13, meaning you would need 26 for a railing project with two terminal posts. For more information on terminal posts see our How To page. 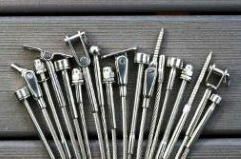 One Set of Field Swaged Fittings, from left to right: Acorn Nut, Hex Nut, Washer, Terminal Fitting, Tensioning Fitting, Washer, Hex Nut, Acorn Nut. 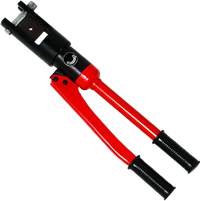 Tensioning fittings allow you to tighten the cable, while terminal fittings only anchor the cable to the terminal post. Generally, a cable will have a terminal fitting on one end and a tensioning fitting on the other. Longer cable runs or ones with corners may require two or more tensioning fittings, however. Learn more about cable length and fitting requirements in our FAQ. The process of attaching the fittings to the cable is called swaging. Once the cable has been inserted into the fitting, the sleeve is crimped against it, holding the cable securely in place. You can choose to have your cable assemblies professionally swaged by SC&R prior to shipping or swage them by hand during installation. Our FAQ page might help you decide which method is best for you.